Installing solar panels on a roof is becoming increasingly common, especially in predominantly sunny parts of the country. But even as this trend grows, one of the most overlooked elements of this kind of home or office upgrade is the kind of roofing material beneath those solar panels. Here's why to know about solar panels and metal roofing. Consider the wisdom of attaching an expensive, hi-tech solar collection system to a roof that won't last as long as the panels. It seems entirely irrational when you spell it out like that, but we see it all the time. What's worse? Not only installing solar panels on new roofs that have a proven short performance lifespan (especially in those sunny parts of the country! ), but installing that new solar system on a older roof that is close to the end of its service life! We helped specify a roof replacement for a client recently. About ten years ago, she had a very expensive solar electric panel array installed on her eight-year-old asphalt shingle roof. Now, in addition to replacing those shingles, she has the added expense of removing and re-installing her solar panels, which is in the neighborhood of $6,000! Another issue that should be considered when it comes to choosing the right roof for those solar panels is the potential for leaks that can be created during the panel installation. There are just a few roof covering materials that can accept the mounting hardware without creating penetrations - and resulting leak points. Metal roofs, and some concrete tiles, can be configured so that the mounting hardware in installed in a manner that hides or altogether eliminates where the fixing point of the solar hardware is attached to the roof structure. Compare that with a composition roof, where holes have to literally be punched through the roof to affix the panels! It's not the best solution. Weight is another consideration. 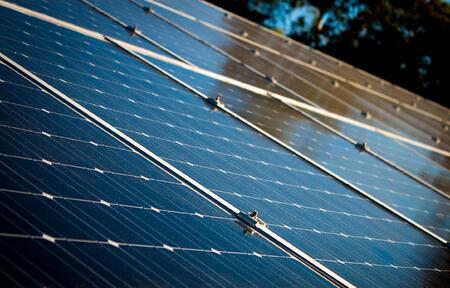 Even though solar panels aren't especially heavy, they do add load to a roof structure. Metal roofs are typically one-fifth or less the weight of concrete, which gives them an edge when you're considering those solar panels. If at all possible, avoid attaching new solar panels to an old roof. Pick a roof to which solar panels can be mounted without making leak-prone holes in the roofing material. Choose a roofing material that will outlast the new solar system. If you're considering mounting a solar panel system on your home, take equal time to consider the roof that will go under it. Your solar panels will provide clean, safe energy for decades, so don't negate their environmental impact by using them on a roof that will eventually end up in a landfill. If you have questions about metal roofing and solar panels, we're happy to help. Contact us today.